This morning in Huntington at 6:20AM it’s currently a muggy 67 degrees under mostly cloudy skies. Winds are calm. Relative humidity is 90%, dewpoint 64, barometric pressure 29.97”. Yesterday’s high was a sultry 85, and the overnight low was 62. We’ve got another warm and humid day on tap for today as an upper level ridge moves across the region and a warm southerly flow continues in the low levels. We’ll see partly sunny skies with a chance of showers and a slight chance of thunderstorms mainly in the afternoon as diurnal heating goes to work. Highs will be in the lower 80s with south winds around 10 mph. Chance of rain is 30%. Tonight should be partly cloudy with lows in the mid 60s and south winds around 10 mph. Tuesday should start out partly sunny with an increasing chance of showers and thunderstorms, mainly in the afternoon, as a slow moving cold front and associated low pressure approach the region from the Great Lakes. It’ll be humid with highs in the upper 80s and south winds 10 to 15 mph. Chance of rain is 30%. Tuesday night should be mostly cloudy with a chance of showers and thunderstorms. It’ll be a muggy night with lows in the upper 60s and south winds 15 to 20 mph gusting up to 30 mph. Chance of rain is 40%. Wednesday’s looking partly sunny with a chance of showers and thunderstorms. Humid conditions will still be in place with highs in the mid 80s and southwest winds 10 to 15 mph gusting up to 25 mph. Chance of rain is 50%. Wednesday night should be partly cloudy with a chance of showers and thunderstorms. Lows will be in the mid 60s. Chance of rain is 40%. Cooler and drier conditions are expected for later in the week with what looks like another nice weekend in the wings. Last year on this date we had a high of 82 and a low of 60. We picked up 0.21″ of rain. Tomorrow will be 0m 41s shorter. The Moon is a waxing crescent, 3d 2h old with 9% illumination. 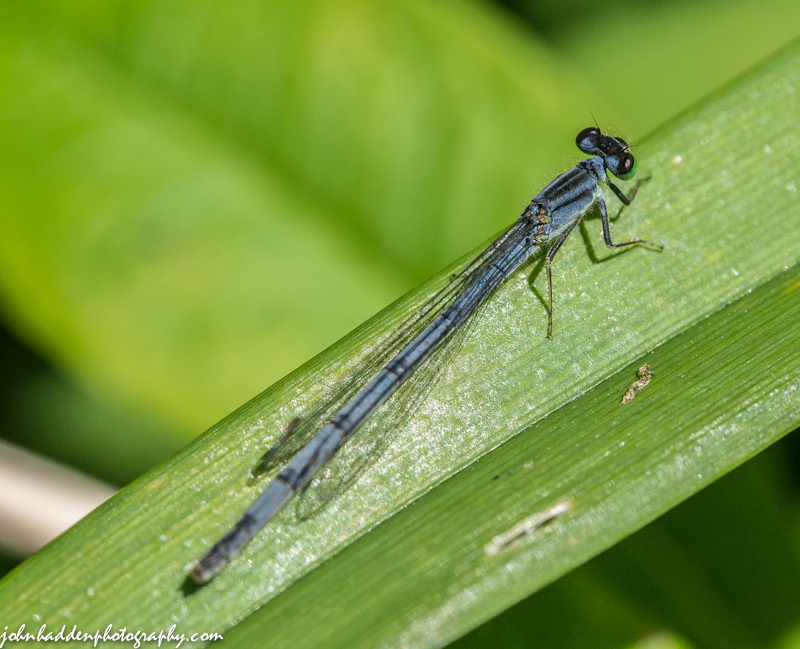 Familiar bluets (Enallagma civile) are among some or the most common and colorful damselflies in our region. The males (like this one) sport a lovely blue hue while the females tend towards a more tawny green coloration. Nikon D600 Sigma 105mm lens, ISO 800, f/11, 1/1600″ exposure. This morning in Huntington at 7:55AM it’s currently 60 degrees under mostly clear skies. Winds are calm. Relative humidity is 98%, dewpoint 60, barometric pressure 30.26″ and rising. Yesterday’s high was 81, and the overnight low was 49. We’ve got another lovely day on tap today courtesy of high pressure. We’ll see sunny skies with highs in the mid 80s and a bit more humidity today. Winds will be light and variable, becoming southwesterly around 10 mph this afternoon. Tonight should be clear with lows in the mid 50s and light and variable winds. Sunday should be sunny with highs in the mid 80s with light and variable winds, becoming southwesterly around 10 mph in the afternoon. Sunday night should be clear and a bit muggy with lows in the lower 60s and south winds around 10 mph. Monday should be partly sunny with a chance of showers. Highs will be in the lower 80s with south winds 10 to 15 mph. Chance of rain is 50%. Monday night should be partly cloudy with a chance of showers. It’ll be muggy with lows in the upper 60s. Chance of rain is 50%. Tomorrow will be 0m 33s shorter. The Moon is a waxing crescent, 1d 4h old with 1% illumination. 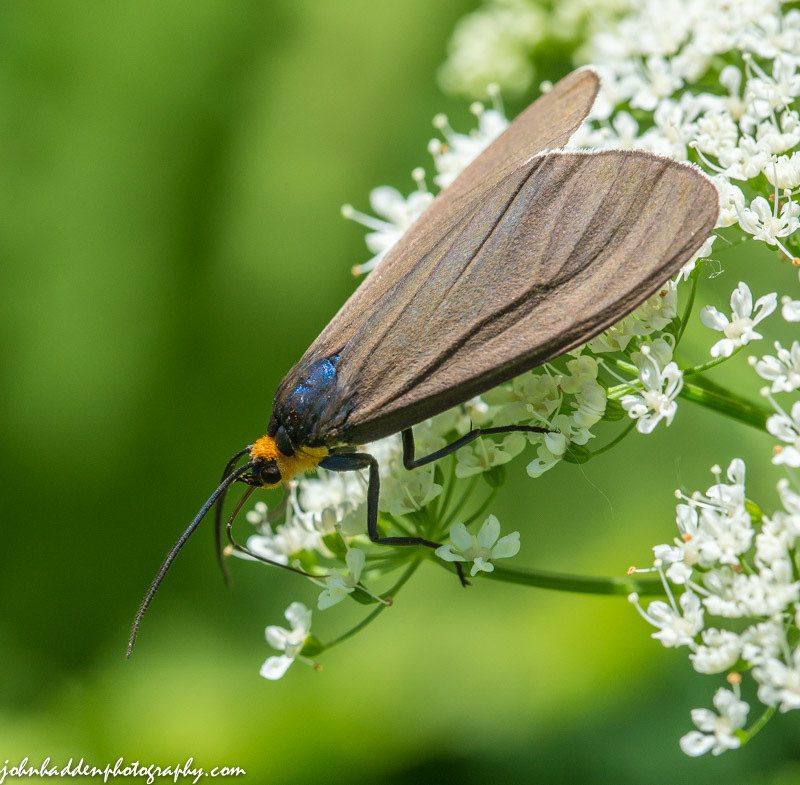 This little Ctenucha moth was flitting about in our front field, flying from head to head in some Bishop’s weed. A fast mover, it was tough to get a shot! Nikon D600, Sigma 105mm lens, ISO 800, f/13, 1/640″ exposure. This morning in Huntington at 6:55AM it’s currently 52 degrees under clear skies. Winds are calm. Relative humidity is 99%, dewpoint 52, barometric pressure 30.10” and rising. We picked up 0.05” of rain in the past 24hrs bringing the total for the two day rain event to 1.62”. Yesterday’s high was 75, and the overnight low was 49. High pressure returns to the northeast beginning today and will persist right through the weekend. Other than some clouds over the mountains today, we can expect plenty of sunshine this weekend with no precipitation in the picture. We’ll see sunny skies today with highs in the lower 80s and light and variable winds, becoming northerly around 10 mph this afternoon. Tonight should be clear with patchy fog after midnight. Lows will be in the mid 50s with light and variable winds. Saturday should be sunny with highs in the mid 80s and light and variable winds. Saturday night should be clear with lows in the upper 50s and light and variable winds. Sunday’s looking mostly sunny with highs in the mid 80s and south winds around 10 mph. Sunday night should be mostly clear with lows in the lower 60s. Last year on this date we had a high of 84 and a low of 61. We picked up 0.50″ of rain. Tomorrow will be 0m 29s shorter. The Moon is new, 2 hours old with 0% illumination. 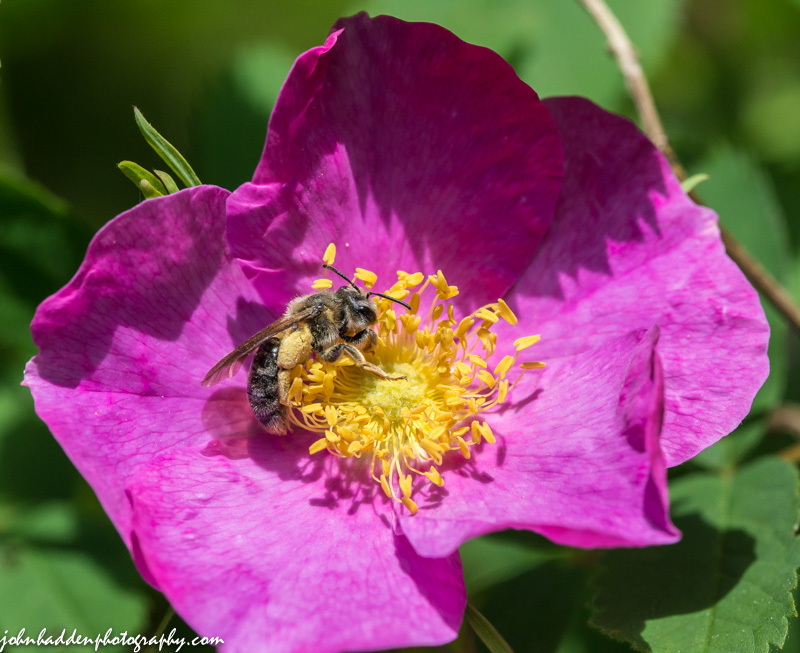 This little sweat bee was quite busy moving rapidly from bloom to bloom on the rugosa rose in our side yard. It was hard to get her to be still long enough to get a shot! Nikon D600, Sigma 105mm lens, ISO 800, f/13, 1/1600″ exposure. This morning in Huntington at 6:30AM it’s currently 64 degrees under overcast skies. Winds are out of the south at 0-2 mph. Relative humidity is 99%, dewpoint 64, barometric pressure 29.83” and rising. We picked up 1.04” of rain in the past 24hrs. Yesterday’s high was 70, and the overnight low as 64. The cold front and associated low pressure that gave us yesterday’s rains have moved east of the region this morning. We’ll see areas of drizzle this morning along with cloudy skies and a chance of showers. Highs will be in the mid 70s with north winds around 10 mph. Chance of rain is 50%. Skies will begin to clear out this evening as high pressure builds in for the weekend. We’ll see partly cloudy skies tonight with a slight chance of showers until midnight. Lows will be in the mid 50s with north winds around 10 mph until midnight, becoming light and variable. Chance of rain is 20%. Friday should be mostly sunny with highs in the upper 70s and light and variable winds, becoming northerly around 10 mph in the afternoon. Friday night should be clear with lows in the mid 50s and light and variable winds. Saturday’s looking sunny and warmer with highs around 80 and light and variable winds. Saturday night should be mostly clear with lows around 60. Last year on this date we had a high of 77 and a low of 62. We picked up 1.59″ of rain. Tomorrow will be 0m 25s shorter. The Moon is a waning crescent, 28d 16h old with 1% illumination. 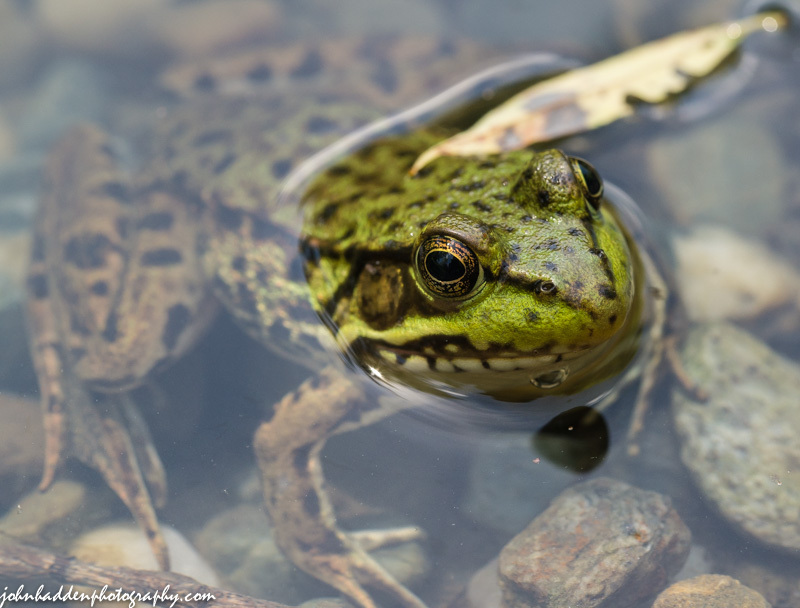 Along with green frogs, leopard frogs are the main amphibious denizens of our pond this time of year. This fellow was quite patient as I stuck my lens nearly in its face. This morning in Huntington at 6:15AM it’s currently 65 degrees and raining under overcast skies. Winds are calm. Relative humidity is 97%, dewpoint 65, barometric pressure 29.84”. We picked up 0.53” of rain overnight. Yesterday’s high was 74, and the overnight low was 65. A warm and humid air mass combined with a slow moving cold front moving south from Canada will bring a renewed threat of showers and chances for thunderstorms today into tonight. We’ll see occasional showers with a slight chance of thunderstorms this morning, then showers with a chance of thunderstorms this afternoon. Some locally heavy rainfall is possible this afternoon. Highs will be in the lower 70s with southwest winds around 10 mph, becoming northerly this afternoon. Chance of rain is 90%. Showers and a chance of thunderstorms will continue into tonight. Lows will be in the lower 60s with light and variable winds. Chance of rain is 90%. Thursday should start out cloudy with showers likely mainly in the morning. Highs will be in the lower 70s with light and variable winds, becoming northwesterly around 10 mph in the afternoon. Chance of rain is 60%. The cold front will clear the region Thursday night bringing partly cloudy with lows in the mid 50s and north winds around 10 mph. Friday’s looking mostly sunny with highs in the mid 70s and light and variable winds. Friday night should be c clear with lows in the upper 50s. Last year on this date we had a high of 86 and a low of 62. We picked up 1.07″ of rain. Tomorrow will be 0m 21s shorter. The Moon is a waning crescent, 27d 15h old with 4% illumination. 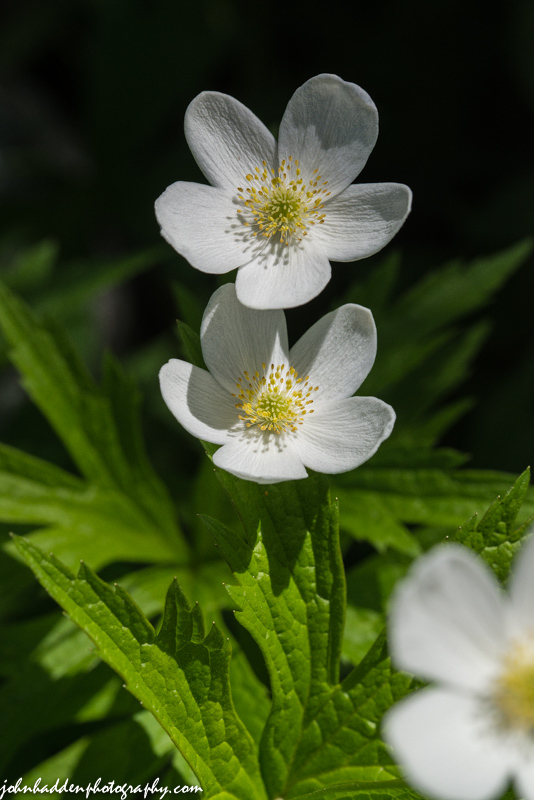 We always get a crop of “volunteer” Canada anemones popping up by the foot of the studio stairs. They are in full bloom right now. This morning in Huntington at 7:10AM it’s currently 67 degrees under overcast skies. Winds are calm. Relative humidity is 81%, dewpoint 61, barometric pressure 30.02″. We’ve picked up just a trace of rain this morning. Yesterday’s high was 80, and the overnight low was 57. A warm and humid airmass combined with a slow moving cold front will bring periods of showers and chances for thunderstorms today through Wednesday night, some of which could produce heavy rainfall. We’ll see cloudy skies with a chance of showers with a slight chance of thunderstorms this morning. Highs will be in the mid 70s with south winds 10 to 15 mph gusting up to 25 mph. Chance of rain is 50%. Tonight will be cloudy with a chance of showers with a slight chance of thunderstorms until midnight, then showers likely with a chance of thunderstorms after midnight as the cold front finally arrives. We could see some locally heavy rainfall possible after midnight. Lows will be in the mid 60s with south winds 10 to 15 mph gusting up to 25 mph. Chance of rain is 70%. Wednesday showers are likely with a chance of thunderstorms. Locally heavy rainfall is again possible. Highs will be in the lower 70s with west winds around 10 mph in the morning, becoming light and variable. Chance of rain is 70%. Wednesday night should be mostly cloudy with a chance of showers and thunderstorms. Lows will be in the lower 60s with light and variable winds. Chance of rain is 50%. The cold front should clear the area by Thursday brining partly sunny skies with a slight chance of lingering showers. Highs will be in the lower 70s with north winds around 10 mph. Chance of rain is 50%. Thursday night should be partly cloudy with lows in the upper 50s. Last year on this date we had a high of 85 and a low of 63. We picked up 0.55″ of rain. Tomorrow will be 0m 16s shorter. The Moon is a waning crescent, 26d 16h old with 8% illumination. This crab spider was having itself a nice meal yesterday morning on a top of a flowing grass head in our front field. Nature in action! This morning in Huntington at 6:35AM it’s currently 47 degrees under clear skies. Winds are calm. Relative humidity is 98%, dewpoint 47, barometric pressure 30.07” and rising. Yesterday’s high was a perfect 75, and the overnight low was 45. Surface high pressure will remain in control today delivering another day of mostly sunny skies and dry weather. It’ll be a bit warmer and more humid as a southerly airflow sets up ahead of an approaching cold front. Highs will be around 80 and light and variable winds, becoming southerly around 10 mph this afternoon. Tonight should be partly cloudy with lows in the lower 60s and south winds around 10 mph. A cold front and associated low pressure will move into the region Tuesday bringing mostly cloudy skies and chance of showers and thunderstorms, mainly in the afternoon. Some thunderstorms may produce heavy rainfall in the afternoon. Highs will be in the upper 70s with south winds 10 to 15 mph. Chance of rain is 40%. Showers and thunderstorms will continue into Tuesday night. Lows will be in the mid 60s with south winds 10 to 15 mph. Chance of rain is 70%. Showers and thunderstorms will continue into Wednesday with some thunderstorms may produce heavy rainfall. Highs will be in the upper 70s with southwest winds around 10 mph. Chance of rain is 60%. Wednesday night should be mostly cloudy with a 50% chance of showers. Lows will be in the upper 50s. Drier weather should return for the remainder of the week. Last year on this date we had a high of 83 and a low of 64. We picked up 0.34″ of rain. The record high was 93°F in 1975. The record low was 41°F in 1940. Tomorrow will be 0m 12s shorter. The Moon is a waning crescent, 25d 16h old with 15% illumination. 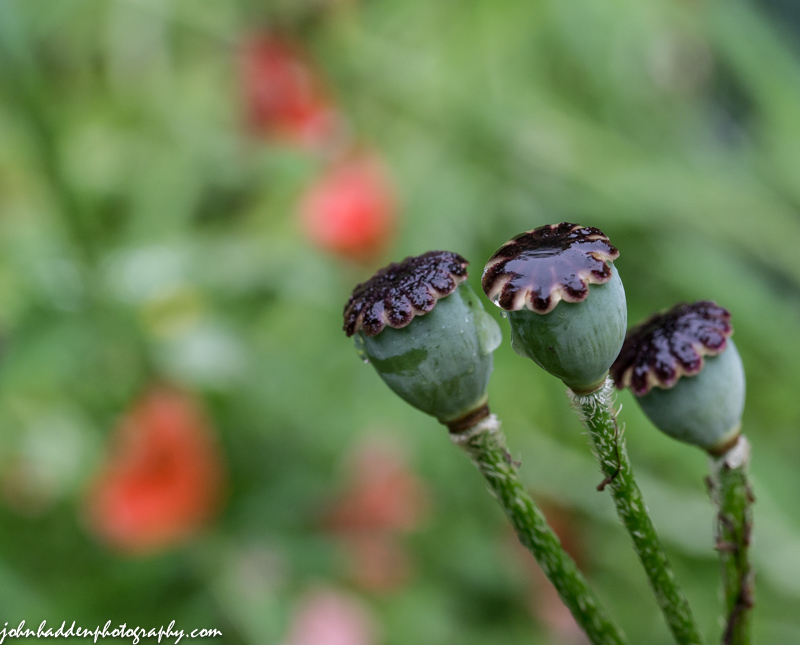 The poppies have popped and now dropped their petals. Nikon D600, Sigma 105mm lens, ISO 1250, f/11, 1/50″ exposure.